Jack teamed up with Sigma and Macphun for creating this time-lapse. As the crew arrived to Hawaii, they were greeted by heavy rain and followed by bad weather and bad luck throughout the whole stay. Heavy rain and cloudy skies, a closed road to the visitor’s center, hiking along a gravel road and hardened lava flow with steam vents… However, they didn’t allow themselves to be left out of patience. And this truly paid out for them. The weather would change within minutes, and as they were waiting, they were able to capture some nice shots when the sky would become clear. It wasn’t until the last night that they actually were lucky enough to capture what they came for – starry skies and lava flowing into the ocean. In 4 days and 3 nights, they captured 1.3TB of data. It took them 5110 miles of flying, 546 miles of driving and over 20 miles of hiking. It took hours of waiting and less than 12 hours of sleep. And not to mention that they risked their health and maybe even their lives. 3 weeks after they returned home, the viewing area where they were standing collapsed into the ocean. I suppose they were not of such bad luck after all. Jack and the team are safe and sound, and I believe all they went through was worth it. 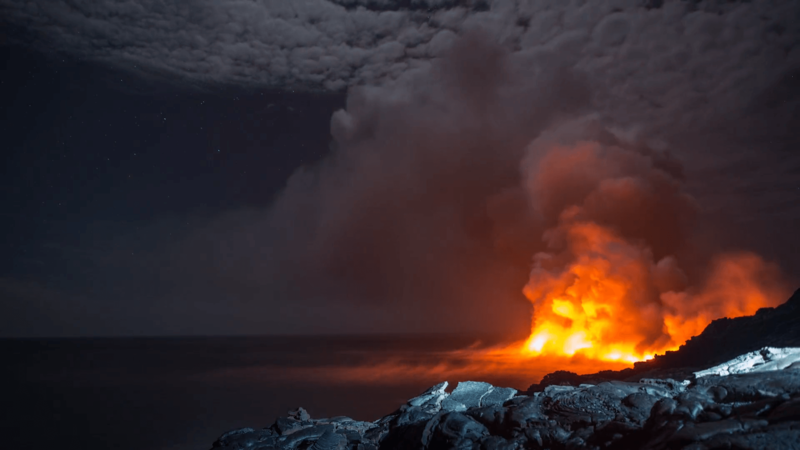 Jack captured what he had imagined – starry skies above the lava flowing into the ocean. And even without the stars, I think this time-lapse would still be exceptional. If you would like to know more about jack’s adventure and creating this time-lapse, I suggest you also take a look at BTS video below.